The Sewing Room opened its doors October 1, 2011, as the realization of an irrepressible dream to own and operate my own fine sewing shop. Heirloom sewing has been an important part of my life for many years. As a young mother in Montgomery, I had the great fortune to grow up among some of the masters of the trade (most notably, Sarah Howard Stone...cutting my sewing teeth on her beautiful laces). During these years, I also sewed for my children, as well as the children of my closest friends. Twelve years ago, after moving to Birmingham for my husband's job, I began mentoring my daughter's friends and teaching them smocking. It was then that I realized the great need to provide friendly instruction and quality resources to all those who wish to sew for their children and grandchildren. 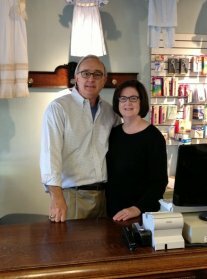 My husband supported and encouraged me in my decision to open the store, even coming out of an early retirement to help me with my endeavor. My daughter, who loves applique and embroidery, was recruited to handle that aspect of our family owned and operated business. With the exponential increase of our business during our first year, I've also been blessed with a professional staff of helpful, pleasant women, who are passionate about sewing and enjoy sharing that passion with others. We all work here because we love what we do...it's something you can't help but notice the minute you walk in our doors! If you can't pay us a personal visit at the store, please browse our website for quality heirloom products, friendly service and prompt shipping.